Home Car News How Do You Escape From Quicksand? How Do You Escape From Quicksand? We’ve all seen quicksand a dozen times in Hollywood movies. In fact, Slate worked out that around 3 percent of the films made in the 1960s had quicksand in them. The usual cinematic cliché is a hapless hero stumbling into a bubbling pit of quicksand (usually with a half-sunk “Warning: Quicksand” sign) in the middle of the jungle. As time slowly ticks away, they steadily plunge deeper and deeper until all that’s left poking out is their outstretched hand. But how realistic are these depictions? And the real question is: how do you escape? “Quicksand” is a term used to describe a mixture of water and fine granular material like sand, silt, or clay. Effectively it’s a bed of waterlogged sand with the viscosity of a super-thick milkshake or, perhaps more accurately, a suspension of corn starch in water. It is a non-Newtonian fluid, meaning any applied stress (like a punch or a stomp) will make its apparent viscosity decrease and effectively turn it solid. This means, in theory, you should be able to run across without sinking. On the other hand, any attempt to yank a limb out of the quicksand will also cause it to seize up and give it solid-like properties. This is partly where the old mantra of “the more you struggle, the more you’ll sink” comes from. So yep, don’t panic. In most scenarios, you would have to be very unfortunate to be fully sucked under. The main concern is getting jammed near the sea with a fast-approaching tide – being drowned in the quicksand itself shouldn’t worry you too much. 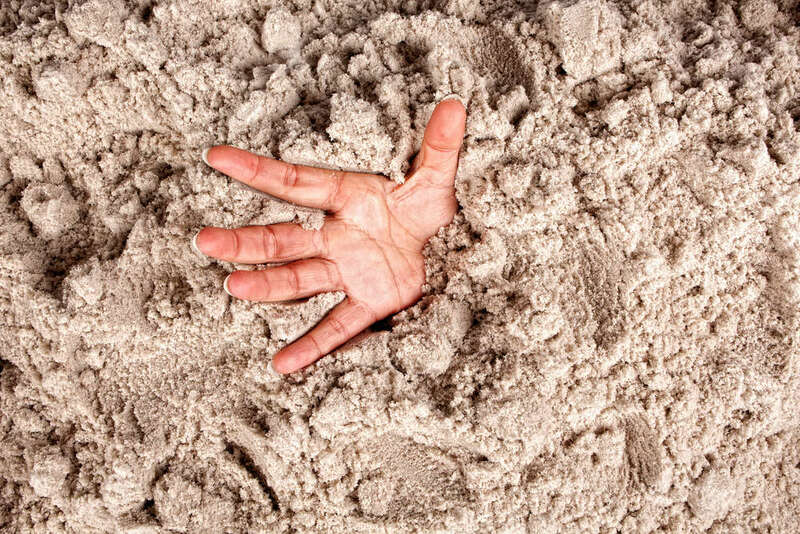 An experiment by Dutch scientists, featured in the journal Nature in 2005, found that humans are about half the density of quicksand, meaning they should technically float on the quicksand provided they don’t struggle and bury themselves. Although, that does mean you should get rid of any unneeded items you might have with you, such as a backpack, as soon as possible. “A person trapped in salt-lake quicksand is not in any danger of being sucked under completely,” according to the study. These properties of quicksand also mean that simply getting pulled out with a rope won’t be as straight forward as it sounds. Pulling a human out of quicksand at a speed of 1 centimeter a second would be the equivalent of that required to lift a medium-sized car. So, don’t pay any attention to Indiana Jones 4 (relating to quicksand, or just in general), it won’t end well if you hold onto a massive snake and get Shia LaBeouf to hoist you out. Emergency services who deal with people stuck in quicksand usually do so by injecting a high-powered stream of water into the quicksand. This changes its viscosity, making it more water, and therefore easier to pull you out. If you’re by yourself and you’ve left your high-powered water jet at home then you can create a similar effect yourself. Slowly and gently wiggle your legs and you’ll be able to make a small pocket around your legs through which water can flow down and loosen the sand. This change in viscosity will make it significantly easier to get moving. From here, try to redistribute your weight and get as flat as possible on the sand’s surface, either on your back or your front. Then you’ve got to slowly and smoothly move out against the mud or sand just like you are swimming. It won’t be easy or particularly fun, however, this calm wiggling technique should be able to sort you out.